Jack the Ripper. The most notorious unidentified serial killer of the world. Rivers of ink have and will continue to flow in the wake of this murderer and the legend behind the mysterious figure will continue to inspire plenty of non-fiction and fiction books. 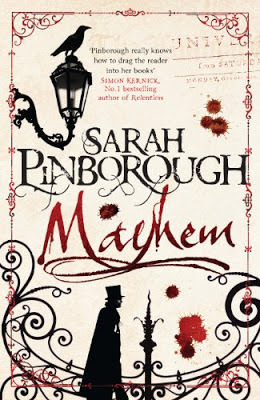 “Mayhem”, the latest novel signed by Sarah Pinborough, is one the books taking places in set in the times of the Whitechapel murders and around Jack the Ripper’s crimes. However, “Mayhem” might be set in a London terrorized by Jack the Ripper and its story develops at the time of these murders, but its focal point is not this series of crimes. Instead, Sarah Pinborough’s novel has as starting point another unsolved crime of that time, one less known, at least for me, the Whitehall Mystery. In 1888 on the basement of the construction site of Metropolitan Police headquarters a headless torso of a woman was discover, followed by one of the legs on the same location and an arm in the river Thames. With the discovery of another headless and legless torso in Pinchin Street on September 1889 it is possible that a different serial killer, dubbed the “Torso killer”, may have been stalked the area at the same time as Jack the Ripper. “Mayhem” assumes that the “Torso killer” and Jack the Ripper are different persons and goes in search of the former. It is only laudable that Sarah Pinborough brings into the attention of the reader one of the parallel cases investigated by the police at the time of Jack the Ripper, because after all it was not the only event happening in the late years of the Victorian era. Even more so when East End London faced an overcrowding of population with the increased number of immigrants and refugees inhabiting the area. The atmosphere of the time is captured to perfection by Sarah Pinborough in “Mayhem”. A dark, choking and oppressive atmosphere is a constant presence in the pages of the novel. Combined with the omnipresent threat of brutal violence and a touch of supernatural the setting is so vigorous that leaves the reader grateful for experiencing it from behind the protective wall of fiction and at the safe distance offered by time and space. The feeling of authenticity is increased through the insertion of true reports from the newspapers of the period, but also of a real letter written by Thomas Bond giving his opinion on the Whitechapel murders. Besides succeeding in the recreation of London of the 1880s final years “Mayhem” manages to give convincing voices to some of the historical figures involved in the investigation of the Whitechapel murders and the Whitehall mystery. Even to one of the presumed victims of the “Torso killer”. The Detective Inspectors Henry Moore and Walter Andrews, indirectly in his case, tell part of the story, Elizabeth Jackson offers one of the early images of the killer, but most of all Doctor Thomas Bond gets the central stage. Thomas Bond is the only character who tells the story from the first person perspective and while the other historical figures of the story might not follow the same train of thought as the doctor they give the reader the possibility to see his character from other perspectives than his own, while at the same time bring the necessary approach to the Jack the Ripper’s murders. The entirely fictional characters make the story whole and help the conclusion reaching its natural course. Aaron Kosminski and the mysterious man in the long black coat become Thomas Bond’s allies, the three of them forming an unlikely team but with the same goal. It is here that the ability of Sarah Pinborough to create such believable characters makes itself fully present, because although part of an alliance, they do not seem to belong together in any moment due to social status, destiny and beliefs. The story of “Mayhem” doesn’t concentrate on the police procedures or crime investigations. Instead it is the story of a man in search of truth, a man becoming obsessed with finding it to the point of self-destruction. Narrated beautifully, the story grows naturally, without in the least being forced or pushed. And even the identity of the killer is revealed halfway through the novel the story doesn’t fall on the predictable course leading to the catch of the murderer. Instead, the supernatural elements are carefully introduced and knitted together with the other aspects of the tale. The background is built, without sacrificing the pace, for the plot to be better sustained. And in the end, with a masterful strike, the blame is not thrown entirely on the real or the supernatural aspects, both having plenty to account for. Sarah Pinborough strays from the beaten paths to give her latest novel originality and although “Mayhem” is a dark story, as dark as Sarah Pinborough used us with, it is also a gripping one, certain to win its unique place in the hearts and minds of the readers. Hmm, this sounds like a book I ought to see if I can get my hands on. I do enjoy books set in the Victorian period, and a little bit of mystery doesn't hurt. Thanks for making me aware of this one! I what I'm talking about because I read Mayhem. I work on a review which I hope to finish until the end of the month.